Survey Statistics: How Hard Is It to Get SSDI Benefits? Our survey showed that people with disabilities who applied for SSDI were approved 51% of the time. If you’ve had to stop working because of a disability or a serious medical condition, you might be considering filing a claim for Social Security Disability Insurance (SSDI). What are your chances of being approved for benefits? To help answer that question, we surveyed readers across the U.S. who recently went through the process of applying for SSDI. Here’s what we learned about their experiences. Seven in ten (70%) of our readers were denied for SSDI benefits at the initial application stage. If that seems discouraging, there are a couple of important points to keep in mind. First of all, the number of denials includes people who were turned down for lack of work-history or recent work (or because they were working at the time they applied). According to government statistics from 2017, 47% of SSDI applicants receive technical denials. So if you look at initial decisions based on medical reasons alone, the approval rate is significantly higher (49%) than it is for all applications. Our survey pointed to several factors that affect the likelihood of getting SSDI (beyond the severity of your medical condition and whether you appeal an initial denial), including when you stopped working and whether you’ve recently seen a doctor (see our statistics on who’s likely to get approved for Social Security disability). But one of the most important things you can do to help yourself is to hire a lawyer. 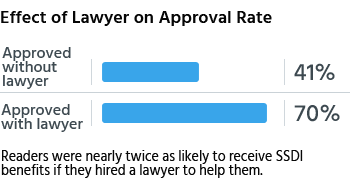 More than 70% of SSDI applicants who hired a lawyer were awarded benefits, compared to 41% of those who didn’t have legal representation. It may help to know that you won’t have to pay your lawyer unless you win your case. If you’re approved for benefits, Social Security will pay your attorney a percentage of your past-due benefits (or backpay), up to 25% of the award or $6,000, whichever is less. Readers who had legal representation for their SSDI applications told us their lawyers received an average of $3,900 in fees. In addition to helping you increase the chances of getting benefits, a disability attorney is likely to help you get more in backpay by convincing Social Security to grant you an early “onset date” date for your disability. 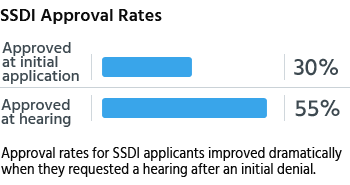 In our survey, 6% of readers who were approved for SSDI benefits reported that they received only a "partially favorable" decision, meaning that the judge decided they became disabled later than their applications alleged. Some people apply for benefits from both Supplemental Security Income (SSI) and SSDI (known as “concurrent benefits”). Although medical eligibility for these two programs is the same, SSI is a need-based program for people with disabilities and little or no income or assets. SSDI applicants sometimes receive concurrent benefits because their SSDI benefits are so low that they meet the financial eligibility requirements for SSI. If their applications are approved for both programs, the additional SSI benefits will bring their monthly checks up to the SSI maximum. Government data for 2016 showed that 10% of those who received disability benefits got concurrent benefits (while 62% received only SSDI). "File for both SSI and SSDI even if you don't think you will qualify for SSI. In my case, it took so long to be approved for SSDI, that by then my assets were depleted to the extent that I also qualified for SSI."